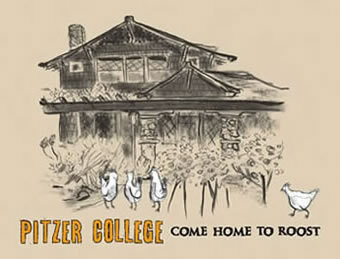 Claremont, Calif. (June 14, 2012)—Pitzer College won two grand gold 2012 Circle of Excellence Awards from the Council for Advancement and Support of Education (CASE) for “Come Home to Roost,” last year’s alumni reunion weekend invitation designed by Communications Coordinator Mona Ducrocq. The invitation earned grand gold in the Excellence in Design Overall Category as well as the Overall Category for Institutional Relations Publications. CASE is an association for advancement professionals at educational institutions who work in alumni relations, communications, development, marketing and related areas. The association’s international Circle of Excellence Awards recognize works that epitomize the profession’s best practices.